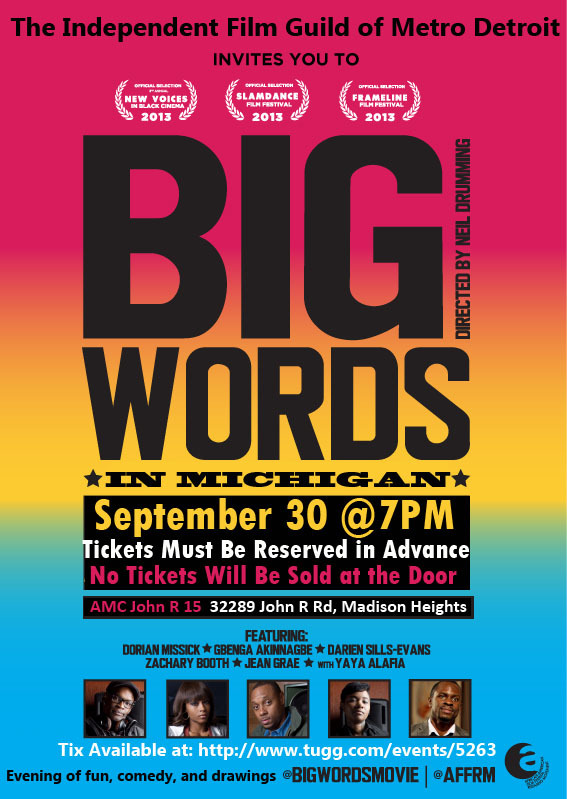 Join the Independent Film Guild of Metropolitan Detroit for a fun-filled, special screening of independent film maker Neil Drumming's movie, Big Words. Big Words is set in Brooklyn on the eve of President Obama’s history-making first election. Three former members of a promising hip-hop crew cross paths again to discover ...that some things never change. Former front man John, once known as Big Words, is now a working class guy who raps only to himself. James is a publicist living with his boyfriend, far removed from the days when he rhymed about getting girls. And, DJ Malik still spins records with a longing for the glory days. Together again on this landmark occasion, the pals reckon with dreams deferred and new hopes. 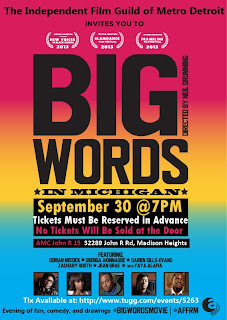 Big Words is a 2013 Official Selection of Slamdance, New Voices and Frameline37. Tickets must be reserved online in advance before September 23rd for $11. There will be no tickets sold at the door. There will be drawings for prizes.